It's not often that President Barack Obama and I agree. But on Father's Day, I was reminded that some issues go beyond political debates and are deeply personal. The president, on several occasions, has spoken powerfully about the importance of fathers. In this year's State of the Union address, the president said his administration will be "doing more to encourage fatherhood -- because what makes you a man isn't the ability to conceive a child; it's having the courage to raise one." I could not agree more. And more recently -- at a commencement address at the all-male, historically black Morehouse College -- President Obama discussed his own upbringing, one in which a father was not present, saying: "I was raised by a heroic single mom (and) wonderful grandparents. (They) made incredible sacrifices for me. And I know there are moms and grandparents here today who did the same thing for all of you. But I sure wish I had had a father who was not only present but involved. (I) didn't know my dad. And so my whole life, I've tried to be for Michelle and my girls what my father was not for my mother and me. I want to break that cycle where a father is not at home, where a father is not helping to raise that son or daughter. I want to be a better father, a better husband, a better man." 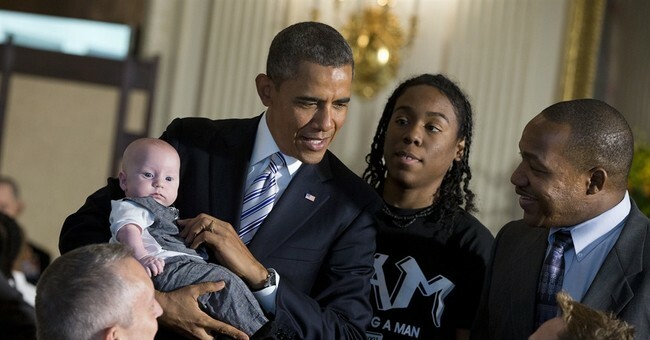 I commend the president for speaking out on the need for responsible fathers. But he still doesn't go far enough. The president fails to acknowledge that truly responsible -- and courageous -- fatherhood requires marriage. America needs its fathers to be married. It needs its men to commit to the one woman in their life and take responsibility for the children they help create. By omitting marriage from his words about fatherhood, the president only halfheartedly addresses the issue that puts our children and our nation's future in jeopardy. Our policies should reflect the truth that married fathers play a vital role in our households. We must encourage fatherhood in the context of marriage. And only marriage rightly understood -- the union of one man and one woman committed exclusively and permanently to each other -- can provide children with a mother and a father. Earlier in his commencement address, the president made an oblique reference to redefined marriage, saying: "Keep setting an example for what it means to be a man. Be the best husband to your wife or your boyfriend or your partner." One moment, he's advocating for redefined marriage; the next, he's insisting that kids deserve both a mom and dad, something that redefined marriage denies. It is hard to communicate that fathers are essential when redefined marriage considers them to be optional. We know the statistics -- that children who grow up without a father are five times likelier to live in poverty and commit crime, nine times likelier to drop out of schools and 20 times likelier to end up in prison. They are likelier to have behavioral problems or run away from home or become teenage parents themselves. Recognizing this reality, much of the 1996 welfare reform initiative that I was deeply involved with focused on strengthening and encouraging marriage. Where marriage declines, the welfare state expands. Today more than 40 percent of children are born outside of marriage, and in most instances, mothers bear the full burden of single parenting. In 2011, Americans were forced to fund single-parent households in the amount of $330 billion. We footed this bill because government steps in to fill the role of absentee dads. In the interest of limited government, government should promote married fatherhood as a matter of personal responsibility and good fiscal sense. It is time that Americans confront the devastating effects that face fatherless children. The president sometimes seems to understand this. We need all of our national leaders to understand it all of the time. We need public officials to make overcoming fatherlessness not just a slogan but an active priority in governing. We need courage to conquer a lifestyle choice that sees no difference in whether a mom or dad is involved in a child's life. Let's remember that renewing America begins in every home where selfless acts of devotion demonstrate the true grit and true love that come with being a committed, married father. And let's support the organizations doing great work to promote fatherhood and strong families -- such as First Things First, serving families in Chattanooga, Tenn., since the 1990s and now in other cities. There's no greater threat to America's future than the vicious cycle of fatherless children -- and no situation we need more desperately to overcome. It is up to all of us in our own lives and families to encourage and support fatherhood.